Most people respond to marketing messages according to how they feel about a product rather than logic. Noted psychologist Robert Plutchik created what is now known as the “wheel of emotions” which describes how emotions are related, which marketers can use to cultivate the desired emotions and response. Now let’s explore how as email marketers we can cultivate these emotions in our subscribers, and influence their engagement. Anticipation: Humans are curious. You can use this to your advantage when crafting your emails. Enticing imagery, trigger words, and teaser content all help to motivate your prospects. Joy: Happy customers mean well engaged, repeat customers. Keep customers happy by offering valuable content, positive imagery, and well-written copy. Trust: Your prospects want to feel safe when interacting with your offer. You can build trust through endorsements, well-known referrers, and reviews. Research suggests that up to 90% of all purchase decisions are made unconsciously and in a matter of seconds. Below are some emotional factors that can influence those split-second purchase decisions. No-brainer: People prefer to buy without thinking. If people are required to think too much when interacting with your offer, you are exhausting them, and the subconscious mind doesn’t like that. Make it easy. Narrow your product choices and cut out unnecessary information. No Risk: People have a natural aversion to risk. As a general rule, people feel loss more powerfully than they feel gain. Consider positioning your product as being the “safe” option rather than the “new” option or give them the option to kick-the-tires before committing. Social Proof: People will follow the crowd. As humans we all like to move with the herd and see what other people like. Provide your customers with proof that other people are buying, and benefiting from, your product. All of the work we do as creative marketers uses the abilities we have to play with emotion. But as email marketers we have additional considerations, which run parallel to emotional triggers, such as preview text/panes, image rendering, mobile views and subject line/content/landing page continuity. All of which must also be considered. Now let’s take a look at how this animated email from Litmus which beautifully illustrates most, if not all, of the emotional engagement and purchase triggers mentioned above. This email also successfully addresses the limitations of the medium. For example, note how well this email rendered on my mobile device. Note too this slick screenshot that was created by a new, free service from MailChimp called Smartphones@. If your emails aren’t tuned to resonate with your audience’s emotions, you could be losing business. If you are having problems developing engaging emails that resonate with your audience, you can look into an email marketing company such as iContact to help you. 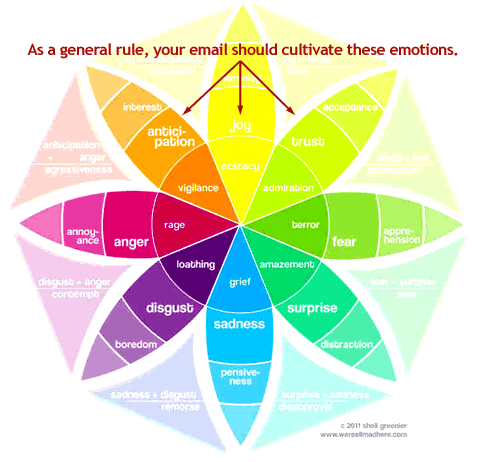 By cultivating one or more of the desired emotions in your email creative, nay…your email program, you’ll boost click rates, decrease attrition, and grow your revenue. But remember this…emotional engagement doesn’t begin and end with email creative…but you can use it unleash the power of this creative thinking in all of your marketing or professional endeavors, not just design or copy of the email itself. P.S. 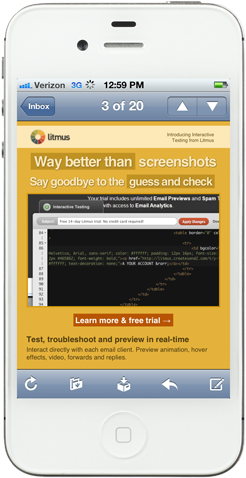 Props to Justine Jordan who created the Litmus email. I’m a fan but not just because she wears an awesome cat hat. Justine’s work reflects that she has strong sense of how aesthetics and copy should work in partnership. ← Full Service Email Marketing: Good Fit, Misfit or Myth? Agreed, Justine’s pretty cool, knows what’s happenin. I find the most difficult one is trust – unless you’re a very well known brand, it’s very hard to build up. What’s worse, is it’s hard to directly measure. So true, Scott. Emotions have a lot to do with how a subscriber or potential customer views you and your brand. I think another important thing to bring up is the use of colors in your newsletters or campaigns and the emotions that those can render in your readers. 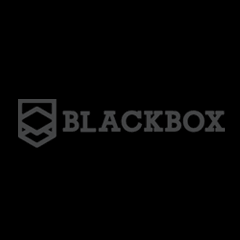 I briefly mentioned them in a whitepaper I wrote about Calls to Action. Great article, per usual! Keep up the great work! People should add this url to their agenda to check every once in a while 😉 A great reminder realy. But don’t give all the credits to emotional links and content.